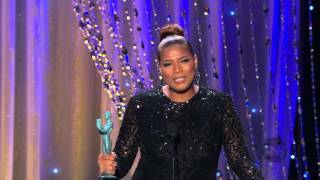 The Eloquent Woman: Famous Speech Friday: Queen Latifah's "Keep fighting for it"
Famous Speech Friday: Queen Latifah's "Keep fighting for it"
And I hope that anyone out there who does not come in the package that people say you should, keep fighting for it. Flip those rocks over. Keep pushing. Keep turning. You can do it. You build your own boxes. Not people. So knock that thing away and do you. The speech was an immediate hit, and a refreshing, rousing example of what you can do with an acceptance speech. What can you learn from it? Accept with strength: Pumping iron with the statuette was an inside joke about the heavy award, and a comic turn that created a visual during the applause. But it also conveyed power and strength, a great alternative for women in lieu of self-disparaging comments or sounding as if you're not sure you deserve the award. The silent gesture said it without looking or sounding boastful. Don't curb your enthusiasm: Awards banquets can be deadly for audiences in the hall and viewing on television, so a lively acceptance like this one--with big gestures and a big smile--tells us we're watching a special moment. Remember, your audience will take its cues from you. If you're delighted, overcome with emotion, or ready to shout from the rooftops, show us how you feel so we know how to react. Don't overdo your emphasis. Just be genuine. Keep it simple: Leading in with a sweeping phrase--"anyone out there who does not come in the package that people say you should"--and following with a series of staccato, short phrases of encouragement helped to build emphasis and energy at the close, just where you want it when you're giving a speech this short and powerful. Queen Latifah makes a great cheering section, all by herself. You can read a partial transcript of her remarks here, and watch the video here and below. Thanks to Rune Kier Nielsen for sending it to me!